We are honored, proud and elated that our Accord Passive House won Honorable Mention in the Single Family category at this year’s PHIUS Passive House Projects Competition! Wow! From more than 3,600 total submissions from 91 countries, our Accord Passive House project is among the 32 house projects selected for the architecture longlist for the first Dezeen Awards, and one of only four projects in the United States! We are honored to be in such excellent company with our fellow nominees. The awards program celebrates the world’s best new architecture, interiors and design with an emphasis on beauty, innovation, social impact and sustainability. 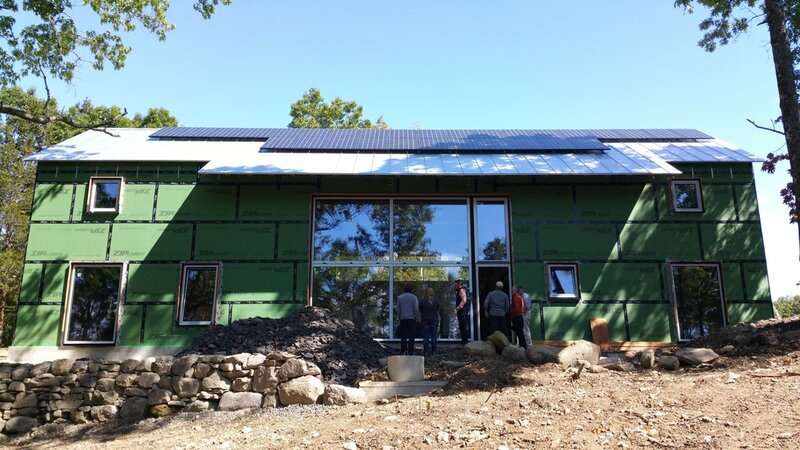 On Saturday, September 9, nearly fifty people joined North River Architecture & Planning (NRAP) for a mid-construction tour of our Passive House project in Accord, NY, hosted by the Hudson Valley chapter of the national Passive House Alliance. NRAP is working with PHIUS, the Passive House Institute US, to achieve PHIUS+ Certification for this 1,730 sf single-family residence, which was designed by NRAP for our Senior Designer, Peter Reynolds. The house has a 9kW photovoltaic array on roof, which is expected to make this a Net Zero building, producing more energy annually than the building requires. The tour was timed so that the building systems and details would still be visible before the insulation is installed the following weeks. Attendees were able to inspect these systems up close, with presentations given by Stephanie Bassler, RA, CPHC and Peter Reynolds of NRAP; John Loercher, CPHC, energy modeler and Passive House consultant; Troy Hodas, PHIUS Rater; Cramer Silkworth, mechanical engineer; and Matt Calardo of Lighthouse Solar. Stephanie and Peter began their presentation with an overview of the project goals of Passive House affordability, use of local contractor talent, and on-the-job Passive House training for the trades. Because not everyone in attendance worked in the industry, for those new to the Passive House world, we talked about what makes a building “Passive” and why we are so passionate about Passive House. We continued with more detailed descriptions of the building envelope and building systems choices as well as lessons learned. NRAP’s experience so far on this project with contractor training was mostly positive, with all trades fully aware of and respecting the airtightness requirements. Peter is acting as his own General Construction Contractor and manages the subcontractors directly, which allowed NRAP team to be very hands on in communicating critical Passive House details to the team. Most assemblies have proceeded without any issues, although the European windows and doors posed some challenges to a crew unfamiliar with those installation requirements. This was NRAP’s first experience working with a PHIUS+ Rater. This team member is a required part of PHIUS+ certification, and is meant to ensure compliance not just with PHIUS certification requirements, but also the requirements of the related programs, including DOE’s Zero Energy Ready Homes and NYSERDA’s program for Energy Star homes. One of the lessons learned by the NRAP team on this project was the importance of layering rigid insulation materials, for which Troy was instrumental in giving step by step guidance. By using single layers of EPS under the slab, and Polyisocyanurate on the walls, we were required to manage the gaps between panels very carefully, and had to do an exhaustive job of spot repair with expanding foam sealant (not our preferred material…) when the joints were too wide. PHIUS Rater inspections have been instrumental to our success so far with our certification goal, as we have been made aware during each phase of work what to pay attention to, and when corrective measures were necessary. Electric air-source heat pumps were selected for heating and cooling this building. These systems have the efficiencies required by PHIUS, and when ductless systems are used, they are quite affordable and readily available. While the heating and cooling demands for this project allowed us to install a system that in total is one-sixth the size of what would be required for a code-built house, we are still working on an architecturally satisfying solution for what these heat pumps look like, which is a concern in the residential marketplace generally. John Loercher’s work as WUFI Modeler was an integral component of the design work by the NRAP team. Beginning with an early design phase feasibility study to confirm that we were on the right track to achieve Passive House certification, we continued to work with John to test options of insulation values, window performance, shading conditions, thermal bridging, and mechanical systems as we finalized all aspects of the design. John also coordinates our submissions to PHIUS and responses to the PHIUS team’s review comments. In our previous Passive House certified project at the Omega Institute, NRAP managed the PHPP energy modeling and related work in-house, but have found that working with John has allowed us to focus more effectively on design, drawings and construction phase concerns, while knowing that the Passive House compliance strategy is handled by NRAP and our team partners. Our goal is ultimately to demonstrate the accessibility and affordability of Passive House design, and to dispel the myths and misconceptions about the process to those who are considering renovating or building their own Passive House. The Passive House Alliance Hudson Valley chapter's work very closely aligns with our goal, and we were glad to have an opportunity to spread the word about their work! Check back for updates on our upcoming project tours, and be sure to follow our work on Facebook and Instagram @northriverarchitecture.